This is a long-term project build! from the black e30M3 you see here, to a White Replica Warstiener DTM e30M3. But my first choice of replica Group-A JPS team with the famous Jim Richards at the wheel(I have a signed #1 drivers door from his 635csi and a #4 door from his e30m3), but the factory lightweight white car is for me! This all started with its eBay purchase, from the boys in QLD goldcoast. It was then driven quickly back to Perth with a good mate Brett, via Melbourne to watch “Bathurst” on my brothers tv and then on the “Great Ocean road” to Adelaide before the big sandpit cross over to W.A! That was fun. Brett and I drove sideways thru most of the Great Ocean road Brett in the dark! later with a side detour through a farmers dirt road only to get a puncture and limp 200k to get it fixed. The work list: First we had to strip it back and add the factory e30 convertible rail bracing to front chassis . Then a repaint in BMW “Alpine Weiss” to the engine bay, boot and door jams all done (thanks to Vince at Intersmash Repairs in Malaga)! I have built a trolley frame for the bare shell to roll around on so mod’s can be done easily. The next thing is to spraypaint the floor and inner cabin in lite-black schults, lighten the wiring loom of all unused wires . Then in the distant future after painting is done and car looks standard , with a bit at a time will modify running gear to BMW Racing ’88 spec’ DTM. The s14 motor, now going to use PPM’s 2.7 stroker kit, Supertech “Black” s38 valve set, Schrick 307/292 cams, Alpha-N EMS on original factory BMW DTM 49mm slideblock injection manifold and DTM Carbon fibre airbox, this should produce around 290-300BHP. Further additions AKG red poly engine/gearbox mounts, short shift kit, 3pc alloy “Group-A” lower control arm kit and all suspension diff’ bushes. BMW Group-A alloy fuel cell and twin bosch #044 fuel pumps mounted in the boot, Ireland Engineerings Wilwood big brake kit 6 pot front 4pot rear calipers on 2pce rotors with alloy hats, an alloy gas coil-over kit,wilwood adjustable brake bias pedalbox assembly, Kaas LSD centre in a 4.27 ratio, customised black leather sparco race seats, Gold Momo “Race”steering wheel and Gold BBS 17×8″LM’s all waiting for the correct time! 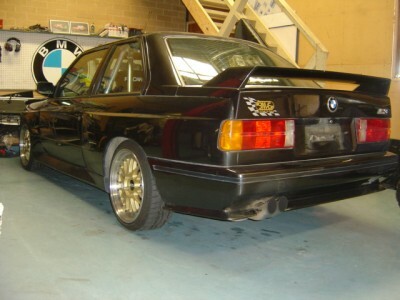 Update 7/2014- With a turn in events this is no longer a “Racecar” project, this light-weight beauty will be a road car looking e30m3, just with DTM 2.7 and all the goodies just under the surface!……more that likely a 2015 project! Update 12/2014- With another turn in events this is no longer mine! Sold to Sam Leitch as a rolling shell on the “gold” coil over kit suspension, all panels bonnet boot etc in LHD still with dash and pedals, Work is to good and time is Short. East to West drive !